The first zone comprises Drenica, Dukacin, and Laba. Drenica provides a link between Montenegro and Macedonia via Prizren and Klina along with Kosovska Mitrovica. The Drenica group controlling the zone is loyal to Hashim Thaçi and specializes in dealing firearms, selling stolen cars, human trafficking, and smuggling products subject to excise taxation (gas, cigarettes). The Thaçi family maintains close ties with the Albanian, Macedonian, Bulgarian, and Czech mafias. The second part spans the communities of Pec, Decani, and Djakovica and is run by Ramush Haradinaj's Metohija group. The Haradinaj family business is built around stolen firearms, drugs, excise products, and stolen cars which are sold to Macedonia, Serbia (Sadjak – Raska), and Montenegro. The group mostly relies on the Pec – Kula – Rozaje transit corridor. The third zone includes the Laba – Gnilane community, Vitina, and Kacanik, all being under the control of the Mustafi family. This clan is chiefly into drug business and cooperates with Haradinaj's group. There are also clans in Kosovo which do business under the control of Tirana-based mafia. Those are the Luka family plus the Selimi, Keljmendini, Eljsani, Kitaji, Suma, Sulja, and Babalja clans. One of the channels of drug delivery from Turkey to Italy and then – to West Europe passes across the city of Tropoj in Albania and via the Drac (Durres) and Valona seaports. In Macedonia the drug trafficking hubs are Gostivar, Kumanovo, and Skopje. Large volumes of heroin are processes by drug factories in Albania and taken to the village of Luzane, then to Muhovac and Veliki Trnovac in the south of Serbia, as well as to Tuzi and Ulcinj in Montenegro. Masses of raw material for drug factories are supplied from Albania to Gnilane and Prizren in Kosovo, where two hard-drug factories are known to exist. US agencies including the CIA admit that Kosovo-based criminal groups are the main narcotics suppliers to Europe. As such, they have largely overtaken their Turkish-Kurdish peers in Germany, control around 90% of drug sales in Hungary and Slovakia, 70% in Switzerland, 50% - in Denmark, and 49% - in France. Most of the revenues – estimatedly, up to $150m annually – go to Hashim Thaçi and are laundered in private banks and currency exchanges. Criminal and terrorist groups are tightly interwoven in the Balkan region where key mafia groups interface with Al-Qaeda. Their shared interests are money, drug supply routes, and human trafficking, including the trafficking of Muslims from Central Asia to the EU. The business generates hundreds of millions of dollars in revenues yearly. The European and Albanian mafia control the E-4 transit route stretching from Romania into Serbia to the Croatian border and the E-8 Bulgaria-Macedonia-Kosovo-Albania route which they use to ship counterfeit liquor, cigarettes, and drugs. In the foreseeable future, the Balkans where politicians are routinely bought by the mafia can fall under its total control and adopt the rules of the game which it dictates. As of today, the Balkans have evolved into Europe's main heroin route. The Albanian and Italian mafias work hand-in-hand in the area, with up to 50,000 of “mafia soldiers” occupying Europe's and the Balkan's key E-10 route (Croatia, Serbia, Macedonia – Greece) linked to the Middle East. Credible and verified reports by former top officers of the Serbian police say that the Albanian mafia absorbs 60-70% of smuggling and drug-trafficking revenues in the Balkans. Moreover, the Albanian mafia controls Kosovo politicians including Hashim Thaçi, Ramush Haradinaj, and Agim Çeku. The might of the Albanian mafia stems from the clan and tribal discipline. An assembly of clans – up to 20 in the biggest gatherings – is at the core of the organization. The assembly's head automatically counts as a political leader. The Albanian mafia should not be perceived as a pyramid with just one criminal boss at the top – rather, it is structured as a conglomerate of multiple pyramids with a large number of leaders. It is an open secret that many of them have long switched their permanent residences from Albania to Kosovo and Macedonia. All of them have strong KLA connections, and the KLA maintains ties with Kosovo politicians and top officers of the army, police, and customs service. 533: 30 seconds to mars. NATO's 15 Years in Kosovo. 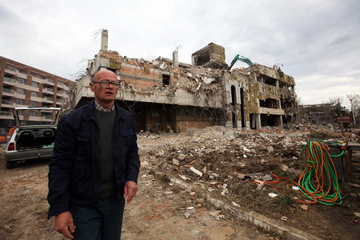 Part 47 July 2014: NATO's 15 Years in Kosovo. Part 4! лучшие комедии. NATO's 15 Years in Kosovo. Part 4.